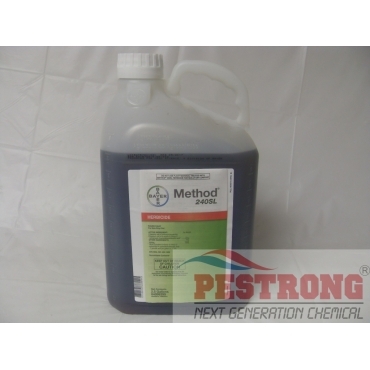 Where to Buy Method 240SL, Method 240SL Herbicide - 2.5 Gallon - $878.95 for Sale with Fast Free Shipping! Method 240SL Herbicide - 2.5 Gallon provides pre emergent and post emergent control broadleaf weeds, vines, and brush species that is quickly taken up by the leaves, stems, and roots of plants. By buying this product & leave product review you can collect normally 87 reward points as a voucher of $8.70(1%). Triplet SF 3 Way Herbicide Broadleaf Trimec.. The effects of Method 240SL Herbicide may be seen on plants from within a few hours to a few days. The most noticeable symptom is a bending and twisting of stems and leaves. Other advanced symptoms include severe necrosis, stem thickening, growth stunting, leaf crinkling, calloused stems and leaf veins, leaf-cupping, and enlarged roots. Death of treated broadleaf plants may require several more weeks and up to several months for some woody plant species. Method 240SL Herbicide is rain-fast at 1 hour after application. Method 240SL may be used for the release or restoration of native perennial grasses and in established, industrial turf grasses. RATE: Vary. but normally 4 - 18 oz per 100 gallons of water per acre. Purchased a new lot that has tons of poison oak. Hit two patches on consecutive days and a week later leaves were turning brown. Now I know it works well going to hit the rest of the lot. May need to order more but if so this stuff does work. It's April and Roundup is not recommended by UC Davis until later in the year. This stuff works early! Excellent broadleaf and brush weed at my yard!